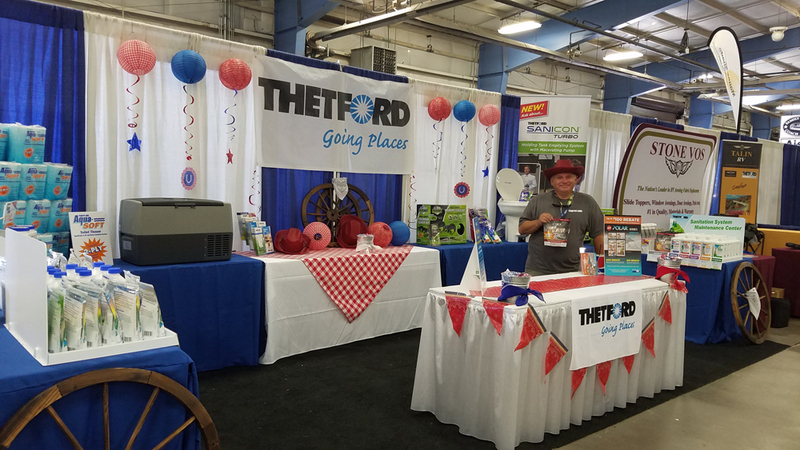 ANN ARBOR, Mich. – RVers at the Family Motor Coaching Association Rally in Gillette, Wy., can receive an up-close demonstration of Thetford Corporation’s new Sani-Con Turbo waste-evacuation system there this week. Sani-Con Turbo delivers the RV industry’s most-convenient, fastest and most-sanitary waste evacuation method available to dramatically improve a process – holding tank emptying – that RVers say is the worst part of RVing. The Turbo demo will take place at the FMCA Rally’s outdoor area, where Thetford and Norcold representatives will also answer questions and conduct consumer surveys and sampling. In addition, Paula Pacholke-Dumont, Thetford’s Chemical Development Manager, will present informative “Potty Time – Straight Talk on RV Toilet & Sanitation System Maintenance” seminars from 4-5 p.m. on Thursday in Seminar Room 12 and from 9-10 a.m. on Friday in Seminar Room 10. Company representatives, including Pacholke-Dumont, will be located at Indoor Booths 228 and 230 in the Cam-Plex Component Area. Thetford/Norcold also will have a Service Table, open from 8 a.m.-1 p.m. for pre-registration of appointments, on Wednesday in the Service Center.